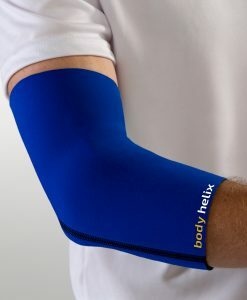 Founded by world-ranked tennis player, Fred Robinson and physician, Thomas E. Parker, MD, Body Helix compression wraps were developed based on both the science of movement and the research on injury management. The development team at Body Helix searched for a material that would do three things better than any other material in the world of compression: Stretch, Rebound and Stay in Place. That search led to the creation of Body Helix’s Body-Form Technology, which incorporates the science and the latest technological advances in fabric design. From that, they have created products, with uniform compression that are uniquely comfortable and effective to wear during exercise. It’s not just the team at Body Helix that believes we are the best. We have given our compression braces to some of the most respected orthopedic doctors, sports medicine professionals and elite athletes in the world, and they concur – Body Helix ankle braces, wrist wraps, elbow sleeves, compression knee sleeves, thigh wraps, back compression wraps, calf compression wraps and other products are not only more effective, they are also more comfortable than any other compression product of similar design on the market today. Without Body Helix, we would have lost this year’s husband/wife National Tennis Championships.